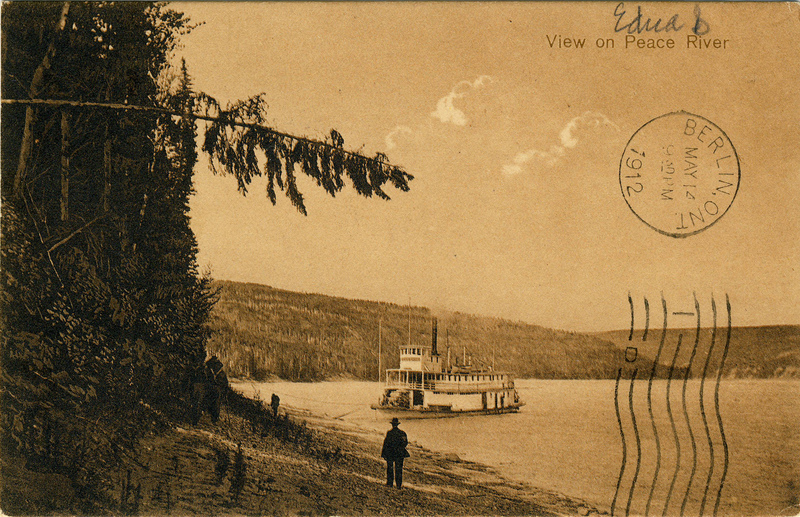 Based in Calgary, the H. Enida Olive Co. was the publisher of many distinctive Alberta postcards. The company appears to have existed for less than two years, having been founded in 1911 and dissolved by early 1913. It is possible that all of its postcards were published in the single year of 1912. Figure 1. Looking N on 6th Street from McKay Avenue, Edmonton. H. Enida Olive and the H. Enida Olive Co. The company’s founder, Harold Enida Olive (1884-1920) was born in Richmond (Surrey), England, in the vicinity of London. He was a son of Enida Higgins Olive (1858-1939), a merchant, and his wife Kate Walsh (1858-1941). While little is known of his early years, the younger Olive made his way to the Far East in the first decade of the 20th century. Masonic records show him as a member of the United Grand Lodge of England, Singapore branch, from which he resigned on March 12, 1911. The next month, he travelled from Hong Kong to Honolulu aboard the China. From Hawaii, he proceeded to San Francisco and then up to Vancouver, from which point he intended to cross the continent overland before taking a final voyage across the Atlantic to Southampton. Despite these well-laid plans, Olive didn’t make it any farther than the city of Calgary, where he stopped and settled in the spring of 1911. He made his one and only appearance in the Calgary city directory (the Henderson Directory) that year, as manager of the H. Enida Olive Co., “Commission Agents”, with offices in Room 301 of the Leeson Lineham Block. Olive himself was a roomer at 1236-11 Av. W. Whether the 1911 Henderson Directory information was gathered before or after the 1911 census is uncertain, but at the time of that census he was recorded as a lodger at an address (345?) on 7 Av. W. He stated his occupation as photographer. As discussed further below, another lodger at this address in 1911 was Albert J. Hill (1888-?) who was also an English-born photographer. Figure 2. H. E. Olive and Ella (Schrader) Olive, likely 1912. Reproduced by kind permission of Mrs Rosalind Hughes, great grand-niece of Mr Olive. While it is only conjecture, it seems reasonable to assume that Olive, possibly accompanied by Hill, spent much of the remainder of 1911 travelling in the vast province of Alberta. His purpose appears to have been to photograph significant sights, as he (or perhaps they) appear to have done in towns such as Calgary, Edmonton, Medicine Hat, Banff, Olds, as well as in a few agricultural districts. As noted below, the photos for the memorable H. Enida Olive series from the Peace River – Athabasca country of northern Alberta were taken on a 1910 expedition, possibly by Edmonton photographer Clarence M. Burk. One may further conjecture that the winter of 1911-12 was spent arranging for the photos to be printed as postcards, including in the form of souvenir booklets (a significant number of the postcards are tear-outs with one perforated edge). The numbering of the cards suggests that several hundred different views were printed — an estimate of 500-600 might be as good as any, given the limited amount of information available. Sales of the postcards probably began in January or February of 1912, as there do not appear to be any postmarks prior to 1912 among Peel’s 200 examples and the earliest postmark among the Peel cards and those in the present author’s collection appears to be February 19, 1912. (Peel 10535 is said to be postmarked in August 1911 — this seems far too early and is likely a transcription error but we will ask the U of A to check). As spring arrived in the year 1912, all seemed to be going well. 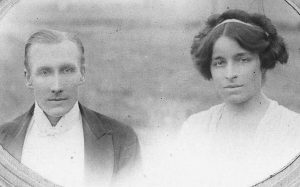 So well, in fact, that Olive arranged for his fiancée, Ella Madaline Schrader (1884-1977), to come out from England to join him in Canada. Rather than have her travel across the whole continent alone, Olive met Ella at Toronto on April 2, 1912, three days after she had arrived in North America (at Portland, Maine, aboard the Megantic). 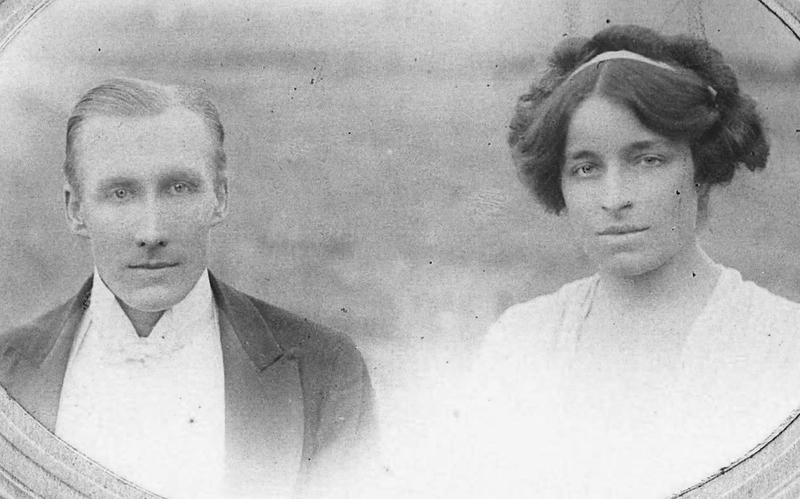 They were married the very same day and headed for Calgary, where the photograph in Figure 2, by George C. Cherer, was taken. 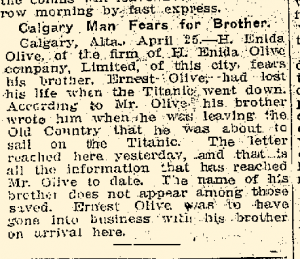 As an additional sign of Olive’s confidence in Calgary’s future, he had also convinced his younger brother, Ernest Olive, to join him there — the intention being that Ernest would work for what would then become the “family business”. Rather than making the crossing on the Megantic with Ella, Ernest waited a couple of weeks and sailed on an even grander ship … the Titanic. An item in the Manitoba Free Press of April 26, 1912 recounted the sad news that the Olives had received (Figure 3). Figure 3. Manitoba Free Press, April 26, 1912, p. 17. It must surely have been Ernest’s death that prompted H. E. and Ella Olive to leave their Calgary business behind at such an early stage. 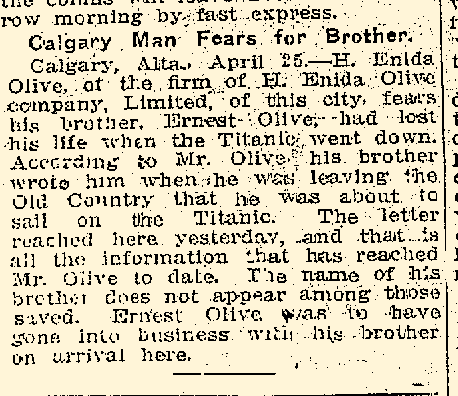 By the time the 1912 Calgary Henderson Directory appeared (with information that would likely have been gathered by mid-1912), the H. Enida Olive Co. was under the management of three men, William H. Dickie, Whitson C. Ridgway and Charles F. Fraser. There is no reference in the 1912 directory to H. Enida Olive himself. All the same, it seems to have been business as usual at the company’s offices at 320-8 Av. W. Indeed, at that time, the H. Enida Olive Co. had (in addition to its new principals) at least three employees: a stenographer, a clerk and a traveller. Of particular interest to us, it was listed in the 1912 directory as a wholesale postcard dealer (see Figure 4). However, if this reflected a period of commercial success, it seems to have been short-lived. By 1913, the H. Enida Olive Co. had disappeared from the city directory and its three principals had either left town (Ridgway) or secured unrelated employment (Dickie and Fraser). Therefore, we can say with some confidence that the lifespan of the H. Enida Olive Co. was approximately mid-1911 to (at latest) early 1913 — less than two years, in any event. Figure 4. Advertisement in the Henderson Directory (Calgary 1912), p. 644. There is not much to indicate what happened to the Olives after the terrible news about the Titanic reached them at Calgary. According to one document, on September 8, 1913, H. Enida Olive entered the U.S. from Vancouver, apparently bound for Los Angeles. Whether he was a resident of either place, as opposed to a visitor from England, is not clear from the record, although the document in question does appear to be an immigration record rather than merely a border-crossing record. On the other hand, in 1919, Olive’s name appeared on the passenger manifest of the Adriatic, sailing from New York to Liverpool. He was recorded on that document as a resident of England as a “Director” — of what was not specified. On May 9, 1920, at age 36, Harold Enida Olive died at Northdown Hall, Margate, a seaside holiday destination in Kent. It is small wonder, given this biography, that Olive’s identity has been unclear to collectors of Alberta postcards. Although numerous, the H. Enida Olive Co. postcards represented only a short-lived business venture on the part of a man whose brief but busy life was primarily spent in England and the Far East. Even had Ernest Olive not had the bad luck to book passage on the Titanic, it is possible that the brothers would have moved on from the postcard business within a year or two anyway. In 1913, the booming Western Canadian economy began to slump and war was on the horizon. Moreover, postcard manufacturers and distributors across North America had been experiencing hard times for several years, as the effects of the U.S. Payne-Aldrich Tariff Act of 1909 rippled through the industry. Given that Olive was identified as a photographer in the 1911 census, it is likely that he (and, as suggested above, possibly also Albert J. Hill) took most of the photographs that were the basis of the H. Enida Olive Co. postcards. Most — although not all — of the images appear to be different from any used by other publishers. On the whole, they appear to reflect a number of photographic journeys to particular parts of Alberta, with other regions of the province being entirely absent. If the company produced these postcards using stock photographs, it is odd that there would be no cards at all representing Lethbridge, Macleod or Frank, each of which was a popular postcard subject and each of which is much nearer Calgary than the Peace River and Athabasca regions. If H. Enida Olive Co. did make use of stock photographs, the most likely candidates could be the many Edmonton images featured in the series. In particular, the “Looking N[orth] on 6th Street” card, reproduced above as Figure 1, is clearly based on the same photographic image that was used by Stedman Bros. Ltd. for its card 1301, “Looking North on Sixth Avenue”. 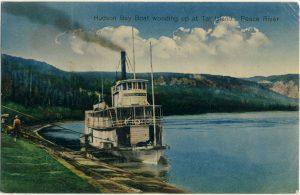 Stedman did continue making postcards as late as 1914, however, so it is possible that the “borrowing” went in the opposite direction. With respect to Albert J. Hill, whose involvement is only conjecture, the University of Alberta’s Peel Prairie Provinces collection includes just a single postcard of his, a real photo that likely dates to about 1920. On the back of that postcard, Hill’s address is given as 233-8 Av. E., which was his business address from 1915 until approximately 1945. The fact that this postcard exists shows, for what little it might be worth, that Hill had at least a minimal involvement in the postcard business within a few years of his acquaintanceship with Olive. Figure 5. Showing the HBC sternwheeler Peace River, this beautiful H. Enida Olive postcard was posted September 23, 1912 at Watrous, Sask. As may quickly be confirmed by looking at the digitized versions of the 200+ H. Enida Olive images in the possession of the University of Alberta, the majority of the postcards exhibited one of two rather distinctive colour palettes — either entirely sepia toned or sepia toned with an added blue sky, often with impressive-looking cumulus clouds as an extra touch. 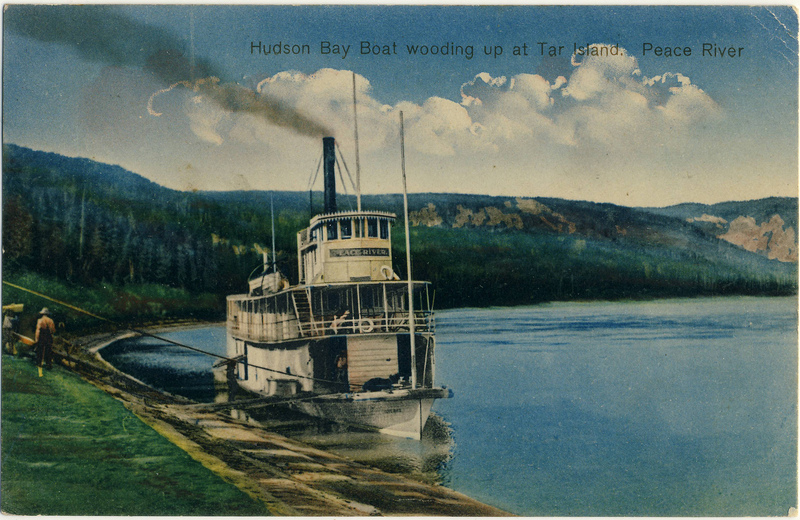 Some cards, such as “Hudson Bay Boat wooding up at Tar Island. Peace River” (Figure 5) have a coloured (rather than sepia) foreground. The image in Figure 6, “View on the Peace River” appears to have been taken just a few minutes prior to the image in Figure 5, but in this example is most attractively rendered entirely in sepia tones. Figure 6. “View on Peace River”. Posted May 10, 1912 at Edmonton. 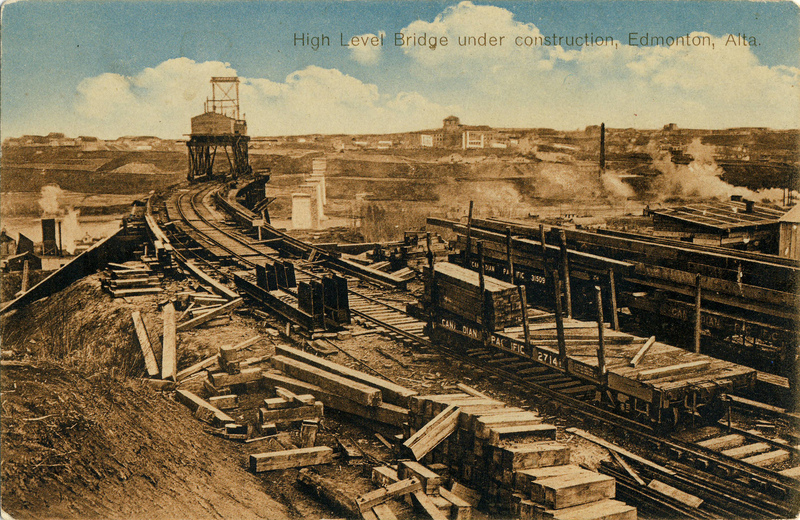 That the postcards were produced in 1912 is evidenced by the fact that Edmonton’s High Level Bridge, which opened on June 2, 1913, is shown only in the early stages of construction (Figure 7), except (tellingly) in a few cards (e.g. Peel 6904, 6913 and 6918) that rely on an artist’s rendering to provide a “completed” view. The Alberta Legislature in Edmonton, also completed in 1913, is similarly shown by H. Enida Olive Co. as a drawing only. There is nothing in the H. Enida Olive postcards in the Peel collection, or that are known to the author from any other source, that is clearly inconsistent with the hypothesis that they were all published in the year 1912 from photos taken in 1911 or 1912, with the possible exception of the Athabasca cards (as noted above) and a minority of postcards that may have been produced using stock images. One card, no. 23, depicts a “motor chemical squad car” of the Calgary Fire Department and is credited on the image to Progress Photo. Co. The number of cards is difficult to know. The vast majority of the cards in the author’s collection are numbered between 1 and 200 or between 1000 and 1060. However, there is also a card “320” and a card “3017”. It appears possible that there was an initial series of several hundred and then one or more special series whose numbering began as “1000”, “2000” (no examples) or “3000”. 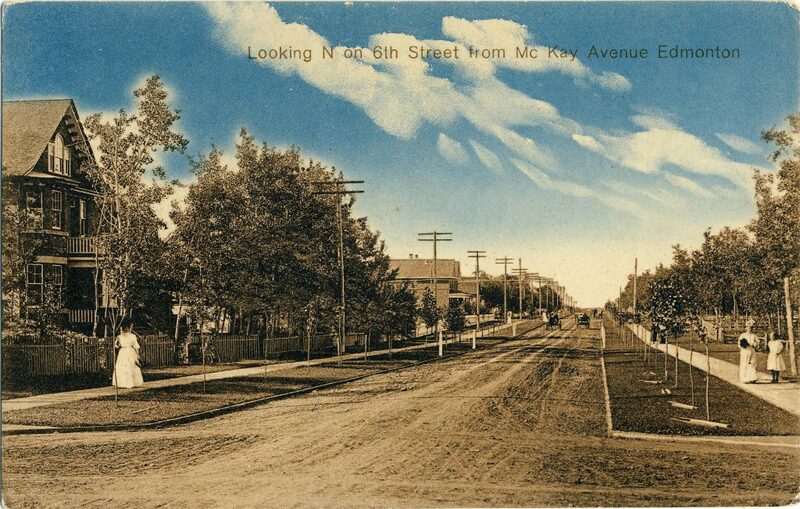 Moreover, card 102 is the same as card 1043, although with a corrected caption (the first read “Looking N. E. from 14th & Victoria, Edmonten, Alta.” while the second corrected the spelling of “Edmonton” and made other minor changes). So it is possible that the 1000 series was partly or entirely a reprint of some views that had already appeared in the first series. While the back style is similar in all cases, there are at least three variants, depending on where the stamp box is located and on the position of the words “POST CARD”. Please note that the information in this post is provisional and subject to revision as this company’s history is researched further. Figure 7. “High Level Bridge Under Construction”, unused, showing Olive’s favoured combination of sepia foreground and painted-in blue sky with clouds. Error: Error validating access token: Session has expired on Friday, 12-Apr-19 20:21:58 PDT. The current time is Friday, 19-Apr-19 21:16:45 PDT.